Before our family decided to live a Paleo lifestyle, we hardly ever ate bacon. It was on the list of "No No's", we can't have that it is bad for you and full of FAT! When you buy the right quality and prepare bacon properly, it can be good for you. This morning I made a big batch of bacon for my three daughters served up with cantaloupe. Paleo breakfast done! Using Trader Joe's Uncured Apple Smoked Bacon, I have used many different brands and for the money, this tastes great and works well! I coat the bottom of my baking sheet with Unrefined Virgin Coconut Oil. 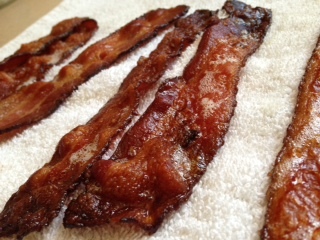 I preheat my oven to 400 degrees, place my bacon on a baking sheet as a single layer with them barely touching and cook. This brand does not shrink up a lot so fill the pan. Bake at 400 degrees for 20 minutes peeking at it now and again to see how it is crisping up. 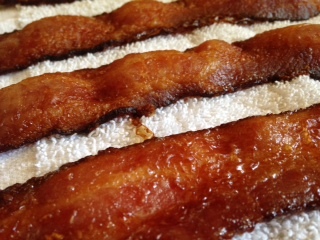 My family loves crispy bacon and I hope you will too!